the cozy birdhouse: meet archie! My newest nephew has arrived! Christopher and Emily welcomed Archer James to their family on Saturday, February 24th at 1:23 a.m. 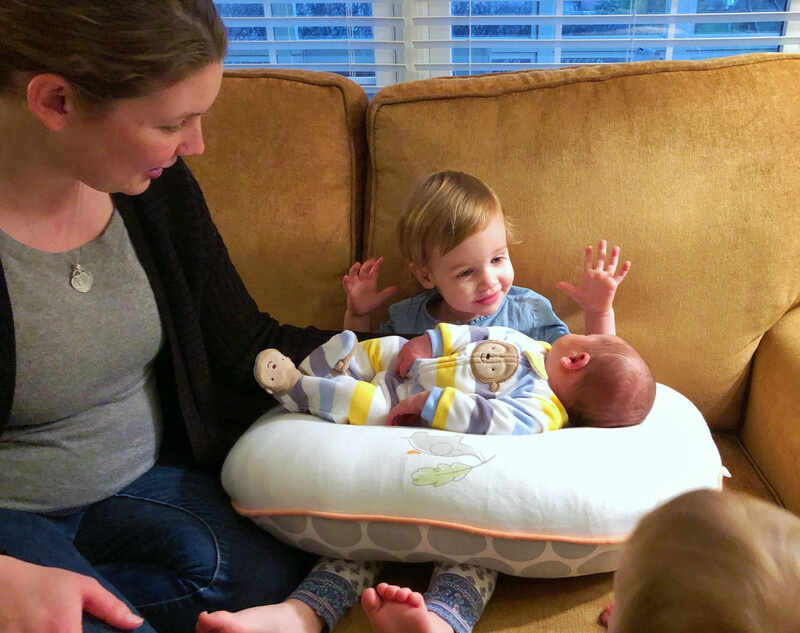 They are home, healthy, and happy, and Oliver is adjusting to life as a big brother. We were super busy this week, scrambling to get our old house empty and clean for closing on Thursday morning, preparing for my big review at work on Thursday afternoon, and organizing stuff in our new house. (I'll share more on that craziness in another post). We are finally getting a chance to relax now, so Mae and I spent the weekend at Grandma and Grandpa's house while Dan spent all Saturday at the movie theater watching five of the Oscar Best Picture nominees. Friday evening, we got to meet Archie! I hardly heard a peep out of him all night as he just wanted to snuggle and eat. He cuddled me for a long while while mom prepared dinner. I look super tired in that photo, but I made up for all the lost sleep this week by sleeping until 11 a.m. on Saturday! Mom and I got to do a little home decor shopping during Mae's afternoon nap before Christopher, Emily, Oliver, and Archer came over again for the evening. We let Mae get a little closer to Archer this time (after applying a hefty glob of sanitizer to her germy little hands). Oliver was very proud to show off his little brother! Mae even got a chance to hold the "BAY-BEEEE," though she seemed a bit apprehensive and didn't know where to put her hands. We enjoyed our short visit very much... visiting family, meeting my new nephew, and sleeping in all adds up to a great weekend!